A big reason why we can help our customers reduce downtime is by remanufacturing centrifuges. Remanufactured (unlike refurbished) centrifuges have equal functionality and capability to new OEM centrifuges. During remanufacturing, a centrifuge is fully dissembled, and all parts are cleaned, repaired, and/or replaced before being reassembled into a good-as-new centrifuge. Remanufactured is not the same as used. Here's how a used and a remanufactured centrifuge are different. The typical wait time for a new OEM centrifuge can be anywhere from 30-52 weeks. Alternatively, the wait time for a remanufactured centrifuge is less than half that. And under certain circumstances, we can provide even faster timelines for delivery. Below, I'll explain how. We maintain an inventory of centrifuges to remanufacture, and we are always in the market for high-quality, used centrifuges that are strong candidates for remanufacturing. While we don't take machines in poor condition, we do buy used centrifuges. The machine that fits your needs might already be in-stock at our facility in Indianapolis, IN. These are machines that we've already vetted for quality and are ready to be remanufactured. If this is the case, we can have the machine ready for delivery in six to ten weeks. All too often, a new centrifuge also means changes to your facility's infrastructure to ensure everything works together once the new equipment arrives. Minor adjustments like moving lines won't be too disruptive, but it's better to have a new machine where you can connect the process piping just like it was before. And with a remanufactured centrifuge, you can ensure all the piping matches up. Now, your baseplate is a separate issue. Baseplates are built to the specifications of the machine they hold down. When you buy a new OEM centrifuge, baseplate replacement is usually required. But, if you have your existing centrifuge shipped to our facility and remanufactured, it can go right back in place. Alternatively, we're able to provide a remanufactured centrifuge that fits within your existing baseplate. Sometimes it has to be the exact same model, and sometimes there are a few models that overlap on baseplate requirements. 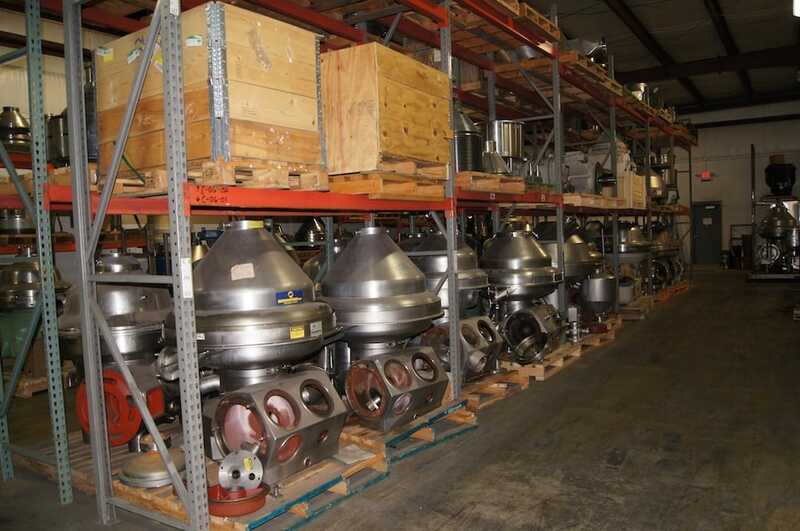 Part of the reason we can provide a Quick Delivery Program for remanufactured centrifuges is because of our skilled staff, extensive parts department, and refined remanufacturing process. These areas have been developed and fine-tuned over the years, so we know what we can and cannot accomplish. Delivering a fully remanufactured centrifuge to your facility in a matter of weeks is definitely possible. We've done it many times before, and we can do it for you.